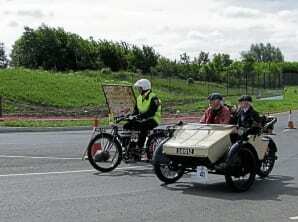 Riding a 1903 Quadrant Banking Tricycle, Geoff Wheeler took the Len Wills Trophy for the best performance on a veteran machine at this year’s Vintage Motor Cycle Club Banbury Run on Sunday, June 19. Bill Moore Trophy (rider nearest allotted time schedule at one or more checks, having gained a gold award): Christopher Brown (1926 Neracar). Vintage Tyre Scheme Trophy (best performance on an early vintage machine): Malcolm Griffin (1922 Coventry-Eagle).